When it comes to your fitness and exercising, Ramadan is a month where you can potentially lose a lot of muscle tone and hinder your fitness goal. So I’m going to share with you 10 important tips on how to workout during Ramadan, which can help with maintaining your fitness routine during this holy month. Let’s set it straight, during the month of Ramadan, your goal is to try and maintain your current fitness level and lean muscle tissue. So this is NOT the time to be focusing on the scale or even to progress in your workout. You should not be training at 100% intensity, 5 to 6 times per week and then stuffing yourself at night. This is the time take a back seat from training or dieting, instead focus on the spiritual aspect of Ramadan. So for those of you who are already exercising regularly, you want to continue your exercises at a much lower intensity and shorter duration in order to prevent muscle lose and weight gain. If you’re watching this video and you’ve never done any form of exercises before in your life, well I’m sad to break the news, but the month of Ramadan is NOT the time to be trying new things. Wait until after Ramadan to start a new fitness routine. However you can still focus on changing your eating habits, which can help with weight loss. Watch my “Ramadan Healthy Meal Guide” video here. 2) How many times per week should I workout? Getting back to working out during Ramadan, “How many times per week should I workout?” I would say aim for the minimum to maintain lean muscle tissue, which is between 2 – 3 times weekly. 3 times on alternate days will be ideal. I want you to already plan your workout days prior to Ramadan. For instance, it can be Monday, Wednesday and Friday. By planning ahead and start to commit, this will instill mental discipline and ensure that you complete your session and give yourself NO EXCUSE! How long should your workout session be? I would stick to 30 – 45 minutes per session. If you were to do a slightly intense workout, then go for 30 minutes, if it’s light to moderate, then 45 minutes will be good. Next tip, how intense should your workout be? To simply put, your Ramadan workout should be about 50% less intense than how you would normally workout outside of Ramadan. Remember, this is not the time to increase the intensity of your workout or to try new crazy exercises. Stick to the workouts or routines you have been doing and regress by decreasing the weights, number of repetitions (10 – 12reps), sets (2 – 3 sets), increase rest time (60 – 90secs) and choose easy option such as normal squats instead of jump squats. 5) When is the best time to workout? Well it is definitely NOT when you are fasting! Only train when you know you can have food and fluid in your body. Training when fasting can be more harmful than beneficial. Training when your body is in starvation and dehydration can decrease strength and muscle mass significantly. A research has shown that dehydrating a muscle by as little as 3% can cause a 12% loss in strength, and that’s not what we want. This is an excellent time to workout because you’ve eaten a small meal and taken in liquids, which can act as your pre-workout meal. However, it really depends on how much time you have between iftar and prayers. 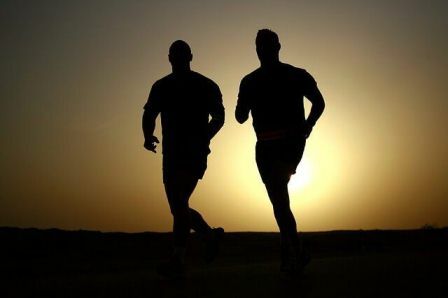 If you choose to workout after Iftar, aim for a short 20 – 30 minutes session with slightly higher intensity. If it’s not too late, this is also a great time, because right after your workout, you’re able to consume your post workout meal or shake. This meal is essential for muscle recovery, muscle growth and can also help with fat loss. To most of you and even to me, this might sound impractical, but if you have the mental discipline to get up really early in the morning and fit in a workout session, your morning workout can give you more energy throughout the day. Drink plenty of water and you can even have a small snack 30 minutes prior to exercising. After your workout, be sure to drink lots of water and eat a light nutrient dense Suhoor meal to keep you going through the day. Another most asked question is “What exercises should I perform?” Well cardio lovers, I’m sad to say that Ramadan is NOT the time to focus on cardio training. Since Ramadan is where you lose muscle tone, it is more important to focus on resistance training over cardio. So aim to do resistance training 2 – 3 times a week, and if you really want to fit in a cardio session, limit it to 1 or 2 days a week, performing 20 – 30 minutes of light to moderate intensity cardio. This is to preserve as much lean muscle tissue as possible. Well, in order to maintain your energy to incorporate an exercise regime, you have to make sure your food and water intake is right. So the next tip is to “Be Conscious of What You Eat”. Aim to eat the right amount of calories and choose food with high nutritional values. Ramadan shouldn’t be the month to go on a low-calorie diet, because not only will you be lacking energy to perform any exercises, your muscles will breakdown from the lack of nutrient, which will not help with weight loss. Saying that, you should also avoid stuffing yourself down with huge amount of food, which can lead weight gain and feeling lethargic. Eat as how you would normally eat and listen to your body. I have a video on “Ramadan Healthy Meal Guide & Recipes”, which I would highly encourage you to watch. In the video, I’ll be sharing recipes, tips on the quantity and type of food you should be consuming and also food to avoid. So be sure to watch it. The next tip is to think Water, Water, Water!! Aim to drink at least 2 – 2.5L everyday, especially on days when you’re exercising. Spread it out throughout the evening so that you’re constantly hydrate and this allows your body to store water when you are fasting. If you’re a coffee or tea drinker, either reduce or eliminate these drinks because they will dehydrate you. Avoid eating or drinking stuff that’ll only make you thirsty such as salty food, sodas and drinks high with refined sugar. Aim to drink water in its purest form and remember, keep drinking plenty of water! The next important tip is to Be Prepared. The best way to succeed is to be prepared. So now that you know all these tips to help you with your workout routine and food intake during Ramadan, let’s incorporate these tips into your lifestyle NOW. Don’t wait until the first day of Ramadan to start eating clean or working out. Don’t tell yourself, this is going to be the final cupcake and I’ll eat better during Ramadan, because I think you know, that won’t happen. Instead, a week before Ramadan is the perfect time to start cleaning up your diet by eliminating all the bad sugary, salty and fatty food and drinks, slowly reduce your caffeine intake and get used to drinking more water. NOW is also the time to adjust your workout routine according to the time you plan to workout during Ramadan and see how that works for you. If you plan ahead and are prepared both mentally and physically, chances are you’re more likely to succeed and stay discipline throughout the month. And the final tip is just for the ladies. Ladies, the best time to workout during Ramadan and to increase your workout intensity is the 1-week break you get. If you’re wondering whether should I when I’m on my period? Well the answer is yes! If you feel absolutely fine, then perform your workout as usual and give it your 100% effort. If however you do experience stomach cramp or discomfort, then take it easy and do gentle exercises. So remember to enjoy Ramadan this year. Use these guidelines and see what works best for you. And of course, make sure your exercise does not affect the main focus of Ramadan. In the end, the focus of Ramadan is spiritual development, so nothing should take away from that. Have a blessed month.